Looking for a midsize SUV to do more than just get you from Point A to Point B in the areas of Avon, Indianapolis, and Plainfield? The 2017 Toyota Highlander is currently ranked in the top three midsize SUVs by U.S. News & World Report, and for good reason. A combination of above-average fuel economy, interior comfort, and a myriad of active safety features is sure to maximize your lifestyle. Equipped with more than 25 different safety features, the 2017 Toyota Highlander is one of the safest midsize SUVs on the road today. These features earned the vehicle a 5-Star Overall Rating from the National Highway Traffic Safety Administration. The Highlander comes standard with safety features, like Traction Control, a Blind Spot Monitor, Brake Assist, auto-on headlights, a rollover protection system, and front and rear tow hooks. Additional available features, like its integrated safety system, up the ante. This system, called the Toyota Safety Sense™ P, contains myriad of safety features that work together and alongside each other. Among these features is Lane Departure Alert with Steering Assist, which helps you stay in your lane using alerts and corrective action. Plus, there’s Automatic High Beams, which turns your high beams off when an oncoming vehicle comes within 2000 feet of your vehicle. The 2017 Toyota Highlander comes standard with a front-wheel drivetrain and a 6-speed automatic transmission. This vehicle is powered by a 4-cylinder 2.7L engine that gets a respectable EPA-estimated fuel efficiency of 20 city/24 highway. * This engine also provides 185 horsepower and 184 lb-ft of torque. For those looking to optimize the already reputable mechanical features of this vehicle, the available 3.5L V6 direct-injection engine may be a better fit for you. This engine comes paired with the all-new Direct Shift-8AT, an 8-speed Automatic Transmission. Get an EPA-estimated 20 city/27 highway MPG* and a 5,000-pound towing capability with this engine. All V6 gas-powered Highlanders can also be fitted with the new Stop and Start Engine System (S&S), which increases your vehicle’s fuel efficiency even more. This system turns off the engine while the vehicle is at rest, which works to reduce your carbon footprint one stoplight at a time. Though we’ve already covered several of the amazing technology features that both come standard and are available for the 2017 Toyota Highlander, there’s still much more to be celebrated in this model. This vehicle comes standard with many technology features that help you stay connected, even when you’re on the road. Its five total USB ports—three at the front and two in the rear—provide charging abilities for everyone’s device, so you never have to go without them. The available rear-seat Blu-ray Disc™ entertainment system with a 9-inch display and wireless headphone compatibility provides hours of entertainment for your rear passengers. 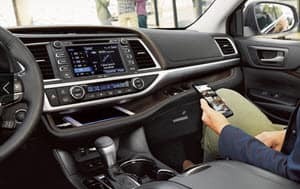 Your rear passengers can enjoy their favorite movies or binge their favorite TV shows from the comfort of the back seats of your new Highlander. 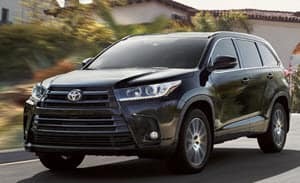 We hope this 2017 Toyota Highlander review has provided you with the important information you need to move forward with your next vehicle investment. The next step in this process is taking a 2017 Toyota Highlander for a spin. Contact us at Andy Mohr Toyota via phone or through our website to schedule a test drive. Getting behind the wheel of this powerful midsize SUV will undoubtedly convince you just how great this vehicle is for driving around Avon, Indianapolis, and Plainfield.